Many American newspapers currently have been re-running the lengthy 1972 storyline that begins when Snoopy starts to read Tolstoy’s War and Peace — one word at a time — and climaxes when, after a silly spat with Woodstock, Snoopy bravely hops the fence in order to save his little bird buddy from the vicious cat next door … only to wind up “rescuing” an old yellow glove. 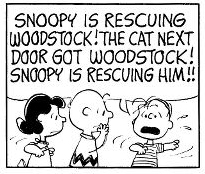 So … how does Linus know Woodstock’s name? We take for granted that Snoopy and Woodstock communicate with each other, via thought balloons and chirps, but they certainly don’t talk to people. And it’s not as if Woodstock’s nest is equipped with a mailing label. We’d be inclined to dismiss this as a single slip on Charles Schulz’s part, except that — as we discovered via some quick research — it happens several more times, with Charlie Brown: in a weeklong January 1973 sequence, when Snoopy gets annoyed after receiving a bill for items he broke during Woodstock’s New Year’s Eve party; when Charlie Brown encourages Snoopy to put an orange in Woodstock’s Christmas stocking (12/23/75); when Charlie Brown chastises Snoopy for getting out of control at another of Woodstock’s New Year’s Eve parties (1/1-3/76); and when Snoopy, traveling to Kansas City, sends Charlie Brown a letter and asks him to say hello to Woodstock (6/22/76). 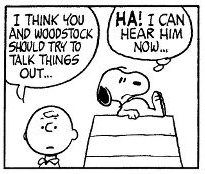 Although the latter offers an explanation for how Charlie Brown would know Woodstock’s name — rather late in the game — it does beg another question; one is forced to wonder how Snoopy penned this missive. No doubt there are other examples of Charlie Brown and his friends somehow knowing Woodstock’s identity; we leave their discovery to our readers. Logically, we can assume that word spread after Linus’ initial announcement, but that still doesn’t explain how he found out. Mention also should be made of 1977’s big-screen film, Race for Your Life, Charlie Brown. Recall that when Woodstock wins the race, he’s honored with a trophy that’s presented to him, by name. Granted, we’ve long insisted that the TV specials and movies are “non-canonical,” but still … it remains part of the same droll mystery. Was Schulz aware of this delightful anomaly? Did he do it intentionally, or did he not realize the whimsical muddle he made of his own continuity?